Taken the massive CAPEX requirements for the nationwide roll-out of LTE networks, extended 3G pricing models for LTE services simply do not serve to obtain the necessary return on investment on LTE networks. Also were it comes to LTE specific services like VoLTE and RCS (Rich Communication Suite) there is little hope that these services can bring the required monetization on LTE networks since OTT players already offer these services for free. 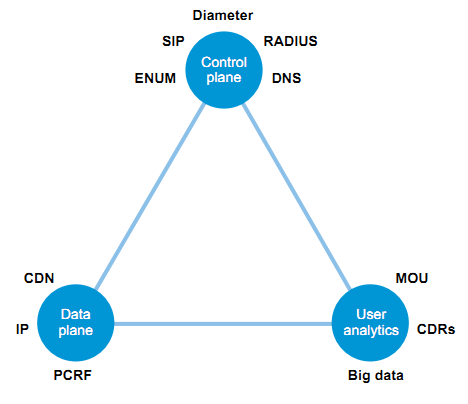 For LTE networks to bring in profit beyond mere access, operators must become experts in three main areas: the control plane, the data plane (traffic) and subscriber data (see figure below). The combination of these might provide both new areas of growth and new ways to generate revenue from an existing subscriber base. Because LTT Business Consulting has extensive international experience in the development of competitive and highly segmented service portfolios, LTT Business Consulting can place all these new service capabilities in the right perspective, cross them with in-depth customer in-sights and as such define the new service opportunities that can create the required incremental revenues.